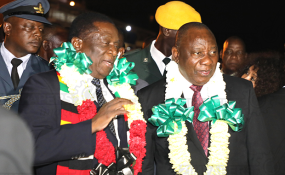 President Emmerson Mnangagwa, left, welcomes his South African counterpart President Cyril Ramaphosa, at Robert Gabriel Mugabe International Airport in Harare. President Ramaphosa was received at the Robert Mugabe Gabriel Mugabe International Airport by his Zimbabwean counterpart President Emmerson Mnangagwa, Vice Presidents Dr Constantino Chiwenga and Cde Kembo Mohadi, Zimbabwean and South African Cabinet ministers, service chiefs and ambassadors from some Sadc countries accredited to Zimbabwe. The BNC will be co-chaired by Presidents Mnangagwa and Ramaphosa. Zimbabwe and South have signed 45 agreements in previous bilateral engagements cutting across economic, political and social sectors. More agreements are expected to be sealed today. Officially opening the ministers' meeting yesterday, Foreign Affairs and International Trade Minister Dr Sibusiso Moyo called on officials from both countries to redouble their efforts to ensure agreed projects bear fruit. "Plausible success has been registered in a number of areas but we must not rest on our laurels hoping that things are going to happen on their own. Delivering concrete results for the benefit of our people remains our paramount objective," he said. The ministers were yesterday receiving progress reports following a meeting of senior officials last week. Minister Moyo said the $400 million National Railways of Zimbabwe (NRZ) deal was back on the rails while operationalisation of the One Stop Border Post at Beitbridge will be on the agenda today. He said local negotiators on the NRZ project met the South African investor, DIDG-Transnet, last month to iron out hurdles impeding the deal. Government, Minister Moyo said, had given the investor a further six months to implement the deal. "I am happy to hear that also the Minister of Transport is ready to confirm in writing the commitment of the South African government to the effect that Transnet is forthright and mandated to undertake this project." On the Beitbridge OSBP, Minister Moyo said modern infrastructure - as espoused in Zimbabwe"s Transitional Stabilisation Programme (TSP) - was a prerequisite for efficient movement goods and services. "The operationalisation of the OSBP will ensure elimination of bottlenecks whose delays are a cause of frustration to travellers and transporters. I trust that our respective officials working on this issues are making progress so that soon we can talk of practical timeframes for the setting up of a One-Stop Border Post." Minister Moyo urged South African investors to take advantage of the various incentives provided for by Special Economic Zones in Zimbabwe. South Africa's International Relations and Cooperation Minister Lindiwe Sisulu said both countries were going through "trying times" economically hence the need to cement their relations. "It is a depiction of the seriousness and importance we attach to this cooperation between the two sister countries," Minister Sisulu said. "Our decisiveness to move forward is not premised solely on the long list of MOUs and agreements but on the implementation. That is why we want to make sure we have accountability of all the agreements we have signed," she said.